The Young Burial Ground is at the location described, in nineteenth century newspaper accounts, as the burial site of notorious local Confederate irregular, “Tom Stacy” (sic), our great-great grandfather, Thomas Hart Benton Stasey. The burial location was apparently concealed at the time because of fears of vandalism, and then lost between the generations. We found nothing at Young Burial Ground, although we know a marker has been found in that area, of Hiram Young who died in 1864, perhaps a war casualty. 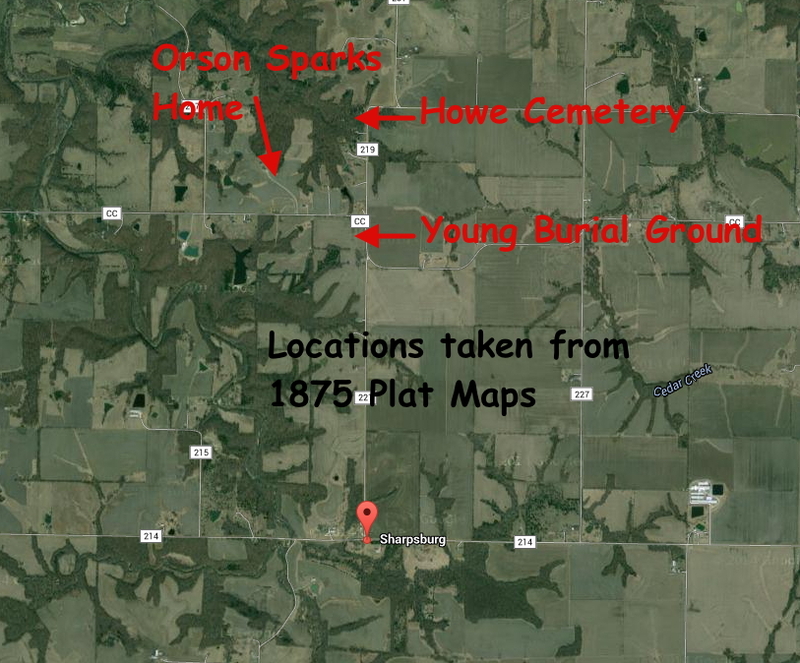 Using the 1875 Plat Map as a guide, we drove west between the Howe Cemetery and the location of the Young Farm, to locate the site of the old Orson Sparks farm. The farm is easily found although there is no house remaining from that era. Thomas Hart Benton Stasey was killed at the Battle of Pierce's Mill, July 19, 1862. 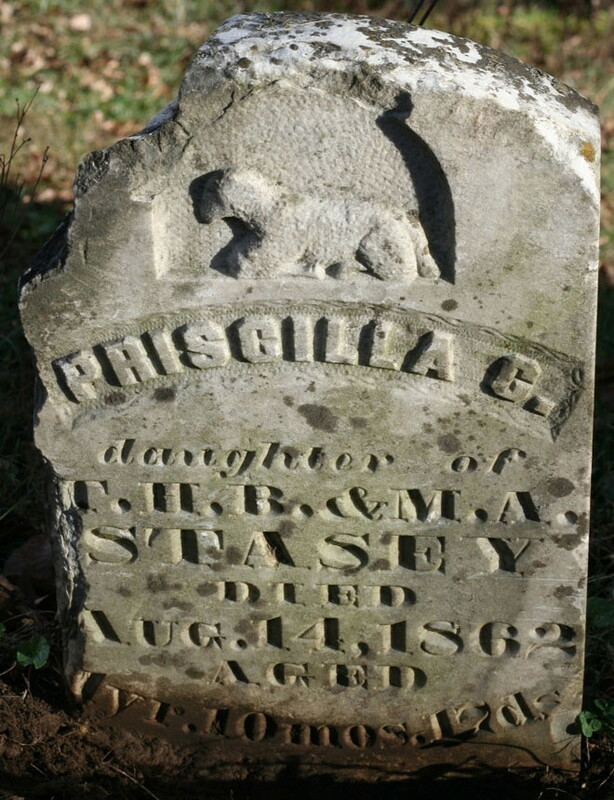 Priscilla Stasey, his daughter, died about August 24, 1862. The widow's parents, Orson and Margaret Sparks, lived at the location indicated above and are buried in the Sharpsburg Cemetery. It seems very reasonable to speculate that the daughter would have been buried beside her father, in Howe Cemetery. The child's marker could have served the family as a clandestine marker for her father, whose notoriety may have made an unmarked grave prudent. To carry the idea further, to those of us who know of THBS through his grandson, Thomas A Stasey, a man of short plans, and rural efficiencies, it seems most likely the daughter was buried in the same grave as the father, the headstone serving dual service to a family in compounded grief, during a time of social violence. No family records, traditions, or even hints concerning either burial have been forwarded to this generation. We are as close to the matter as we are likely to get.